"We do what we can to endure." A24 has debuted the first official trailer for David Lowery's indie drama A Ghost Story, which premiered to rave reviews at the Sundance Film Festival. This was filmed quietly down in Texas after Lowery finished work on Pete's Dragon. Casey Affleck and Rooney Mara star as a couple in the film. Affleck turns into a "ghost", wearing a white sheet with holes for eyes, who returns to his home and watches over. This film is much more deep and much more profound than you're probably expecting, which is exactly what this trailer hints. Described as "an unforgettable meditation on love and grief, A Ghost Story emerges ecstatic and surreal—a wholly-unique experience that lingers long after the credits roll." The song used in this comes directly from the film, and it's a lovely first introduction to this one-of-a-kind film. Jordan Raup of The Film Stage says the film is "a stunning meditation on the passage of time" in his review. Recently deceased, a white-sheeted ghost (Casey Affleck) returns to his suburban home to console his bereft wife (Rooney Mara), only to find that in his spectral state he has become unstuck in time, forced to watch passively as the life he knew and the woman he loves slowly slip away. Increasingly unmoored, the ghost embarks on a cosmic journey through memory and history, confronting life's ineffable questions and the enormity of existence. 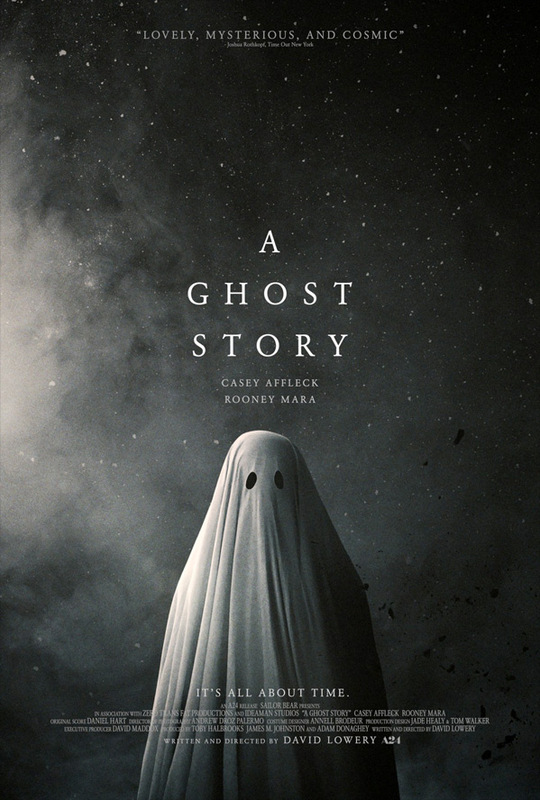 A Ghost Story is written and directed by American filmmaker David Lowery, of the films St. Nick, Ain't Them Bodies Saints, and Pete's Dragon previously. This premiered at the Sundance Film Festival earlier this year. A24 will release Lowery's A Ghost Story in select theaters starting July 7th.